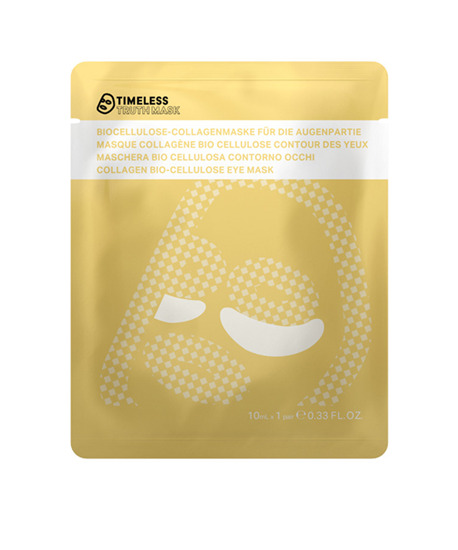 Collagen Bio Cellulose Eye Mask The rejuvenating Bio Cellulose Eye Mask helps reduce fine lines and crows feet. Its special formulation of active ingredients aids the reduction of wrinkles and puffiness around the eye area. Its gentle action with Bio Cellulose cloth minimises the potential of skin irritation leaving the skin moisturised and with increased elasticity. SKIN TYPE: All skin types BENEFITS: Helps reduce fine lines and wrinkles. Skin is softer and tighter. Area is moisturised. INGREDIENTS: Olea Europaea husk oil is moisturing, promotes skin elasticity and cell regeneration. Anti Oxidant. Sodium Citrate, Anti Oxidant, Chlorophenesin, Antifungal and Antibacterial. Palmitoul Dipebtide – 5 Diaminobutyroyl Hydroxythreanine otherwise known as SYN – TACKS. It is a multipeptide and is recognised for its capacity to stimulate significantly the all relevant proteins including collagen of the Dermal Epidermal junction. HOW TO USE: 1. Use after cleansing. 2. Gently place the mask around eyes and make sure the mask covers completely the eye areas to penetrate deeply. 3. Remove mask after 15-20 minutes. Post cleansing is not needed. 4. Gently massage the remaining serum onto the skin. 5. Apply skin care products thereafter. INGREDIENTS: Olea Europaea husk oil is moisturing, promotes skin elasticity and cell regeneration. Anti Oxidant. Sodium Citrate, Anti Oxidant, Chlorophenesin, Antifungal and Antibacterial. Palmitoul Dipebtide – 5 Diaminobutyroyl Hydroxythreanine otherwise known as SYN – TACKS. It is a multipeptide and is recognised for its capacity to stimulate significantly the all relevant proteins including collagen of the Dermal Epidermal junction.